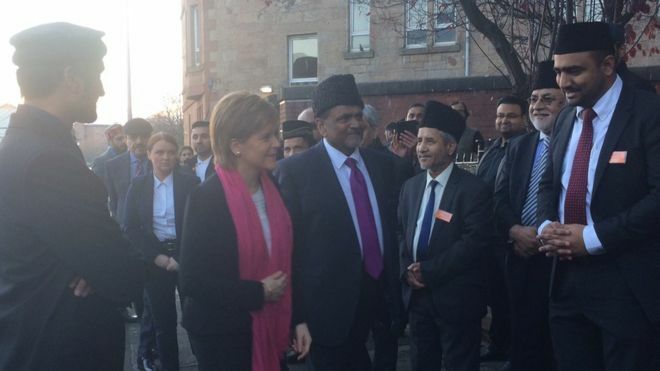 Nicola Sturgeon has visited the mosque which was attended by murdered Glasgow shopkeeper Asad Shah. During her visit to the Ahmadiyya Mosque in Glasgow, she stressed the need to promote peace, tolerance and understanding. She also met members of the Ahmadiyya Muslim community as they launched a campaign to increase awareness and understanding of their beliefs. Mr Shah’s killer Tanveer Ahmed claimed he “disrespected the Prophet Muhammed”. Why was shopkeeper Asad Shah murdered? As well as visiting the mosque, Ms Sturgeon will speak at a special peace symposium taking place at Glasgow University. Ahead of that speech, the first minister said: “The peace symposium demonstrates the commitment of the Ahmadiyya community to promoting the values of peace, tolerance and understanding and is an important opportunity for us to restate our shared values and our shared aims. The Shah family had moved to Scotland from Pakistan in the 1990s to escape persecution as a result of their religious beliefs. As Ahmadiyya Muslims, they believed another prophet succeeded Muhammed. The majority of Muslims believe Muhammad was the last and final prophet – and anything other than that is blasphemy. Ahmed, a father-of-three from Bradford who did not know Mr Shah, claimed to have been offended by clips the shopkeeper had posted online which he said “disrespected the Prophet Muhammad”. Mr Shah’s brother and a shop assistant tried to fend him off as he launched his attack on the popular businessman, who was described by locals as a “pillar of the community”. Hundreds of people laid flowers and took part in a silent vigil in memory of the shopkeeper shortly after his murder. Ahmed was given a life sentence at the High Court in Glasgow after admitting the murder in Glasgow’s Shawlands area on March 24. Share the post "Nicola Sturgeon visits Ahmadiyya Mosque in Glasgow"